This October I’m going to blog every single fricken’ day. I tried this last year and missed a few days. Because my darling Charlotte was in excrutiating pain and we landed in the emergency room with her fibroid cysts for a day. And well, you know, a trip to the ER can ruin a few days. In the West Village. 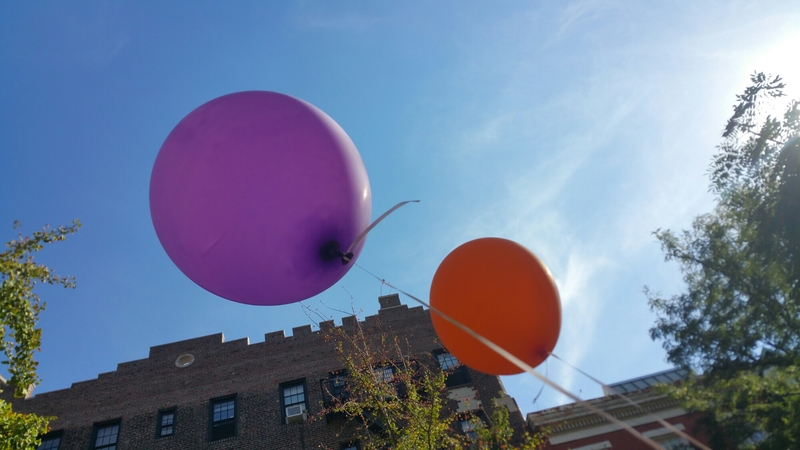 Balloons over the steps of Alma Mathews House, a short-term residence for faith-based professionals. The house is being sold. Change is inevitable. Mindfulness reminds us of impermanence. Be mindful. Breathe. Notice. Be present. Not so funny? Maybe. But fun, and as previously mentioned, trendy. Seriously. I came up with this theme when I realized I was just madly cycling through life. Ever feel like you’re just riding your bike in place? Not going anywhere? That’s called spin class. Also, trendy. I like to ride a bike, sure, but I like to go places. I realized at the end of September that I was restless. And I thought I would pursue a month of mindfulness to center myself. Figure out where I am and who I am. And what’s important. And remind myself to be. here. now. Stop a minute to breathe. That’s all. My husband introduced me to mindfulness and it has been the best thing for me. Looking forward to following your journey!